This is a picture of a man covered in blood. The man is in the process of being killed. He is in pain. He is about to die. Don’t worry, though, he is a fictional character, Sonny Corleone, played by the actor James Caan, being made to look as if he is covered in blood and being killed using special effects in a film, The Godfather. This week, specifically Friday, the front page of every major national newspaper bore a picture, or pictures, of a man covered in blood. The man was in the process of being killed. He was in pain. He was about to die. He was factual and not played by an actor; he was Colonel Muammar Gaddafi, deposed leader of Libya, who was finally, and perhaps inevitably, captured and killed by rebel troops in his home city of Sirte on Thursday. The video footage from which the ubiquitous screen grabs were taken was shown on BBC News in the afternoon, over and over again. I don’t know if the footage was shown on Sky News, but I suspect it was. This was a newsworthy image, from newsworthy footage, and its newsworthiness was never in doubt. Gaddafi was a dictator and he was killed by his own people (with a bit of bombing help from NATO) after 42 years in power. The uprising against him, and the sanctioned NATO assistance, tell us a lot about the so-called Arab Spring, which continues to rage across the Middle East and North Africa, and I’m not debating the need for the world media to cover this story in detail. It’s front page news in any year, in any decade, in any country, in any language. What I question is the decision to run these gory pictures, in many cases blown up to large size for maximum impact. When I went to pick up my paper on Friday morning I was pretty offended by the sweep of bloody faces at my feet in the garage. Gaddafi is dead. Gaddafi was killed. Gaddafi was beaten to a pulp before being shot. We get the picture. But did we actually need to see the picture, without warning? I’m really only talking about the impact of the front cover images here, the ones that were on display in newsagents and garages up and down the land, where tiny children – and, hey, the adult squeamish – were likely to see them. I know, I know, the argument runs thus: this image of a bloodied, pre-death dictator was all over the internet within seconds of the footage being released by the National Transitional Council (they don’t sound much like a death squad with that name, do they? ), so it would be a dereliction of journalistic duty for the mainstream news media not to follow suit and publish/run it. It is, after all, proof of a man’s death. And hey, it’s already out there. But there is still a difference between the internet, where many unpleasant images are just a click away from the eyes of users of all ages, and stacks of newspapers in a newsagent. It felt a bit like Snuff Day. It felt to me as if it was OK to run pictures of this particular man in pain and about to die because he was a bad man. I’m not saying he wasn’t. But although the Sun went mad with vengeful bloodlust, it was no more exploitative than the other, more “respectable” papers really. (You had to admire the Express and Times, and I think the Star, who at least ran the picture small.) As Billy Bragg stated on Question Time the other week, human rights apply to all humans, and not exclusively to those humans that other humans have deemed worthy. Was there no dignity available for Gaddafi? Had he actually forfeited that human right? You might say yes. After all, when the body of Mussolini was hung on a meat hook from the roof of a petrol station in Milan in 1945, I expect these photos were sent around the world (albeit perhaps with a little less velocity). As with my recent whine about animal rights, some of you may think me wasting my energy worrying about the dignity of a dead dictator. But it does coarsen our view of the world if men covered in blood, moments before death, are displayed across our newspaper covers. When I was at the NME, we debated long and hard about whether we could print the photograph of Richey Manic after his self-inflicted “4 REAL”. If memory serves, we decided against running it as the cover image, and only ran it in black and white on the news pages. It appeared, in full colour, inside the paper. But he was not dead. He was fine. This was 20 years ago, when competition with other media was less stiff, and newspapers were in a less of a panic about copy sales. I guess it took a brave newspaper editor not to run the bloody Gaddafi pic full splash on the front cover. I’m not sure I always approve of the world I live in. OK, here’s where I break my first New Year’s Resolution, but it is an illuminating case. I don’t get to write for the newspapers very often. But in the limbo between Christmas and New Year, the Observer called and asked me if I would write a 1,450-word profile of the actress Natalie Portman. It was New Year’s Eve. I said yes, and spent the rest of the day researching it, online, and writing it up. By the time I filed the copy, at around 6pm on Friday December 31 for publication on Sunday January 2, I was something of an expert on Ms Portman’s life and work. 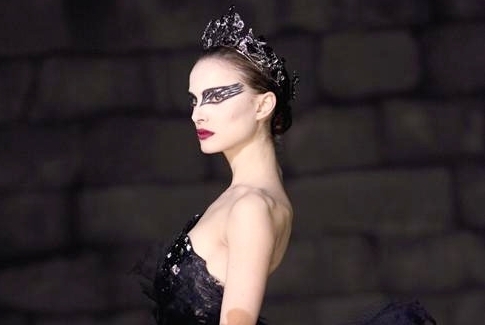 It was to tie in with the imminent release of the ballet thriller Black Swan, which is kicking up quite a lot of interest because Darren Aronofsky directed it, it has received seven Golden Globe nominations and it has a lesbian scene in. Anyway, I was delighted to be asked to write something for a national newspaper. They don’t use non-contracted freelancers at the Guardian and Observer as a rule, so they must have been pretty short-handed to offer me the gig. It appeared online on the Saturday night, and in the paper the next morning. They cut some passages, and neatened it up, but it’s pretty much as I wrote it. A couple of attempted gags, but mostly fairly vanilla. It is, after all, a profile, and not an opinion piece. It’s not about me, it’s about her. You can, if you wish, read it here. It’s pretty benign stuff. Or so I thought. Hey, most of the comments – an astonishing 73 before they closed it – were harmless, either commending Portman for being a committed vegetarian or doing a degree at Harvard and potentially harming her own career in Hollywood; others discussed the merits of Black Swan. But even when writing a vanilla profile of a Hollywood actress, you still draw aggressive flak from certain quarters. (In other papers, profiles of this type are run without a writer’s credit.) To be honest, I can take or leave Natalie Portman. She’s alright. The new film looks interesting. I couldn’t give a toss whether or not she was in the rubbish Star Wars films. She comes across as a bit of a dullard in interview, and I’m certainly not that impressed that she did a degree. I know lots of people who’ve done degrees. They are not better than the people who didn’t. But I reiterate: it’s not about me, it’s about her. The big illustration is of her. That’s what a profile is. Had I interviewed her, and failed to ask her why she killed all those Palestinians, I would be journalistically deficient. All this goes to show why you should not get sucked into a dialogue with anonymous posters on newspaper comments sections. I’ve done it before, and I had sworn not to do it 2011. It only took me two days to break that resolution! And there really is no reasoning with someone whose views on a volatile international political situation are so passionate they feel the need to weigh in after the profile of an actor.